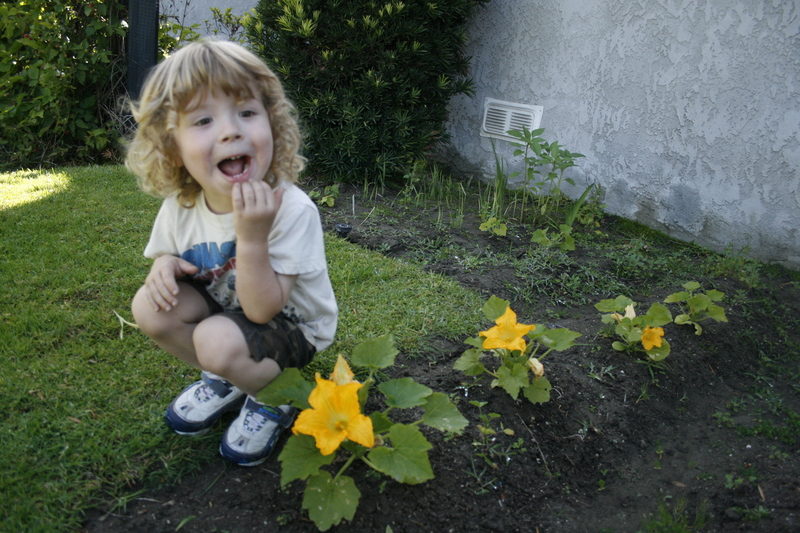 When you grow, care for, cook, and eat a vegetable, you become emotionally attached to that vegetable for life. You eat with your heart, not with your mind. When I got married at the young age of 21, I did not even know how to cook. I had to learn as I went, and in the beginning my meals were very much like a rookie’s. A lot of boxed dinners, single courses, and not very healthy. I gained a lot of weight that first year of marriage. =) Then after a while I started cooking better and we started eating better. Then after a while, we had a baby. Now suddenly the food we put into our mouths mattered so much. A year and a half after his birth, Andy and I started reading the work of Michael Pollan, which changed our lives forever. Now I’m greatly interested in food activism and I’ve become obsessed with knowing where my food comes from. As cook of my household, I feel it’s my responsibility to feed my family the healthiest options I can, and also make them fresh and free of stuff that isn’t food. So since we’ve now been in our house for about two years now (as opposed to the apartment where we previously lived), I’ve started growing my own food. It has been a joy to do this, and I’ve grown to really enjoy gardening, a hobby I never would have imagined for myself. Kumquats from our tree out front. I made kumquat marmalade this year and it was really good. It’s a fairly sour little fruit, so it’s great coupled with something sweet. I really like it on whole grain toast with cream cheese. Our lemon tree produces fruit year round. This is another food source that was here when we moved in. 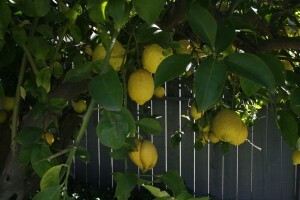 I really enjoy fresh squeezed lemonade and always having a fresh lemon on hand for the many recipes that call for it. 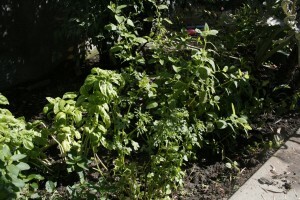 Here’s the herb garden. I’ve got rosemary, spearmint, lemon balm, cilantro, and basil. 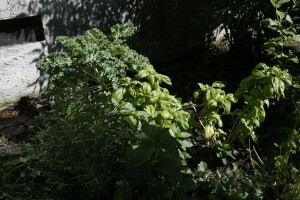 It’s lovely to cook with fresh herbs, and the aroma is just divine. 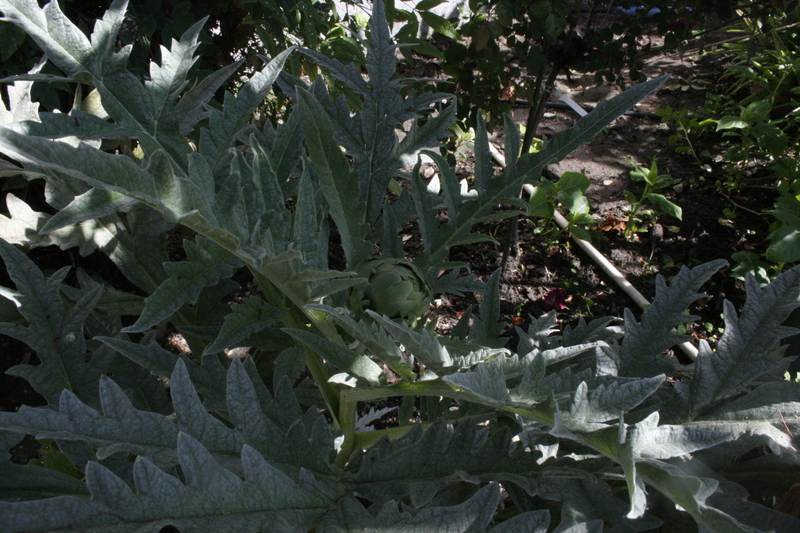 The artichoke plant has been fun to watch. The stalk from the original plant seems to be dead, but another 3 have popped up. The big one is not producing well this year and seems to be dying. This one is the next oldest and is doing ok. I kind of decided recently that I don’t really like whole artichokes like I thought I did. I think this is a leftover repulsion from morning sickness. But I enjoy watching to see what the plant does. 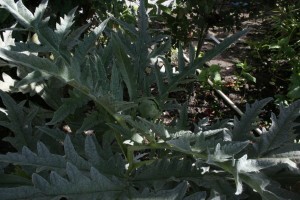 Right now we’ve got an artichoke starting to bloom. I’ll be sure to post a picture of it once there is something to show. Tried growing potatoes for the first time this year. We shall see how they do! fresh flowers are also nice on my table. 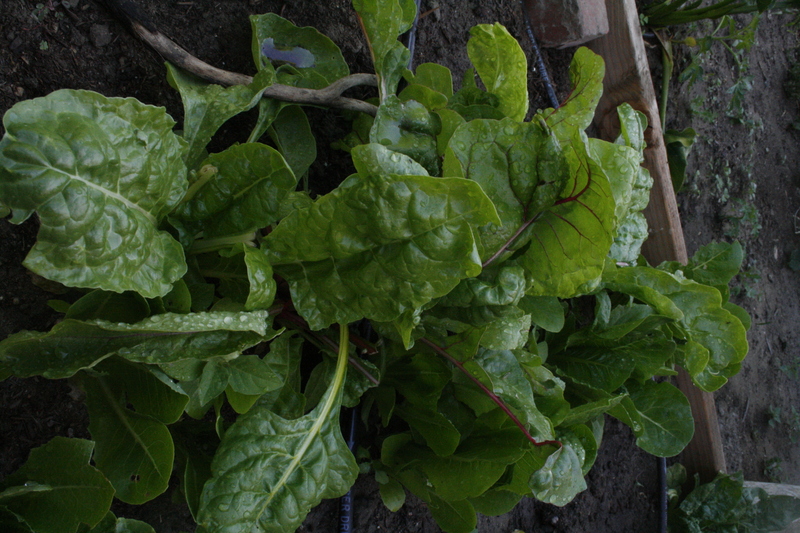 I have SO much chard. It’s ridiculous. And awesome. 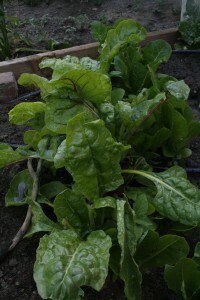 I also have a lot of spinach, and some romaine lettuce. I wish it was the lettuce that I had a lot of, but that’s okay. Really enjoying these greens. I grew them from seed, which is a personal accomplishment for me! I love eggplant, so I’m excited for this one. Last year’s eggplant took a long time to produce, so I’m trying to be patient with this one! My favorite: not-so-healthy Eggplant Parmesana. Loaded with cheese, but I can’t resist. Eggplant is so yummy. A healthier option for us is stir-fried or grilled on sourdough to make a yummy sandwich. That is one of our favorite meat-alternatives at BBQs. 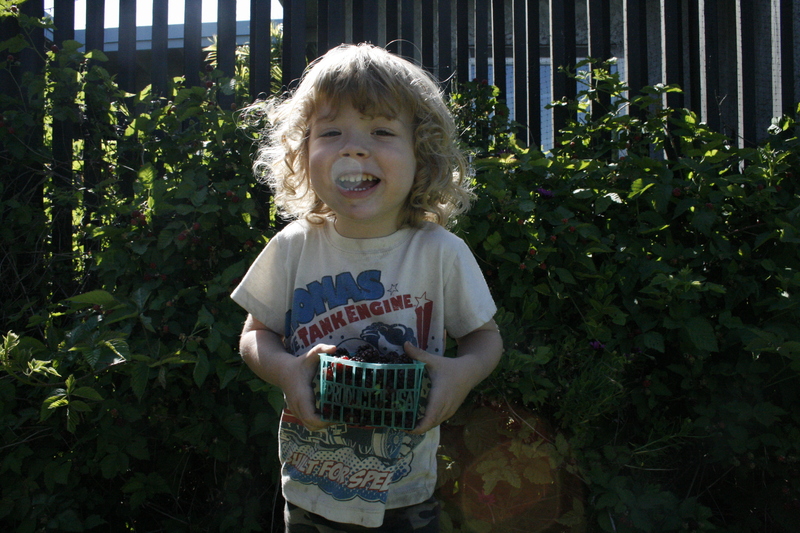 Yay strawberries! Last year we had enough to stop buying them over the summer. Let’s hope they do well this year too! Heirloom tomatoes on the way! These will be purple. 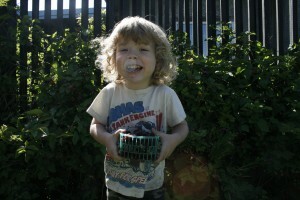 I also planted red cherry tomatoes and adorable little yellow ones. They are as tall as me now and busting out of their cages. I sure hope they provide me with a lot of beautiful, yummy salad! 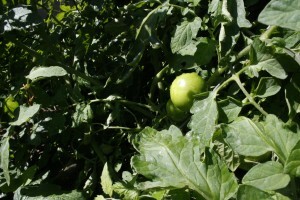 In addition, we have TONS of volunteer tomato plants that are probably last year’s roma and cherry. 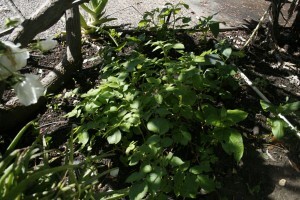 I dug up a few and gave them away and then transplanted a couple more into my front yard garden. Those seem to be holding up so far. I hope the ones I gave away are doing equally as well. And by the way, I just read an breathtaking article by Barry Estabrook on Gilt Taste that made me never want to eat anything but a homegrown tomato ever again, especially not one that comes from Florida. And it has very little to do with health. Please, check it out. 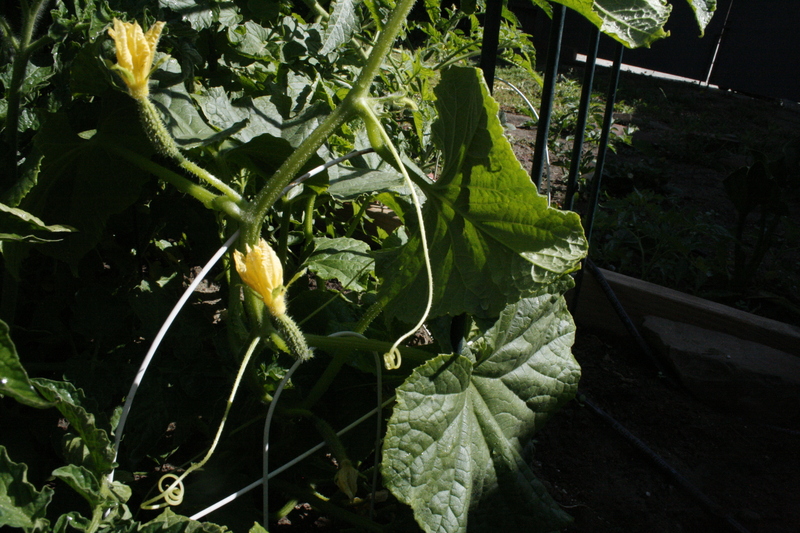 The cucumber plant is doing great. 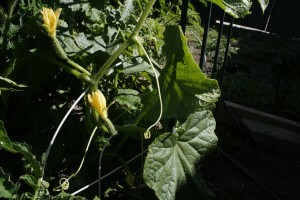 It’s really tall, climbing up our little trellis. But the cucumbers are tiny! I’m fearing that the giant tomato plant is getting in its way. I hope I get some cukes! 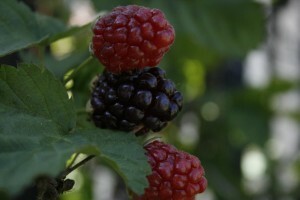 My favorite is the blackberries. 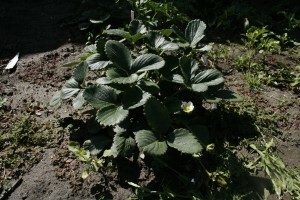 They grow in our front yard, and are another of our landlady’s delicious foods she left us. They have a very short season and will be done soon. So far I’ve made blackberry cobbler, blackberry sorbet, blackberry freezer jam, and lots of fruit salad and berries on cereal and yogurt. They are already starting to dwindle. I will be so sad when they’re gone! zucchini! I also planted these from seed. They look good so far. 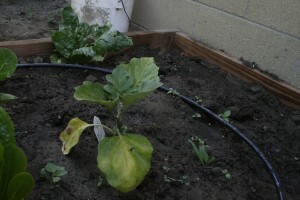 No zucchinis yet. I have high hopes, though. 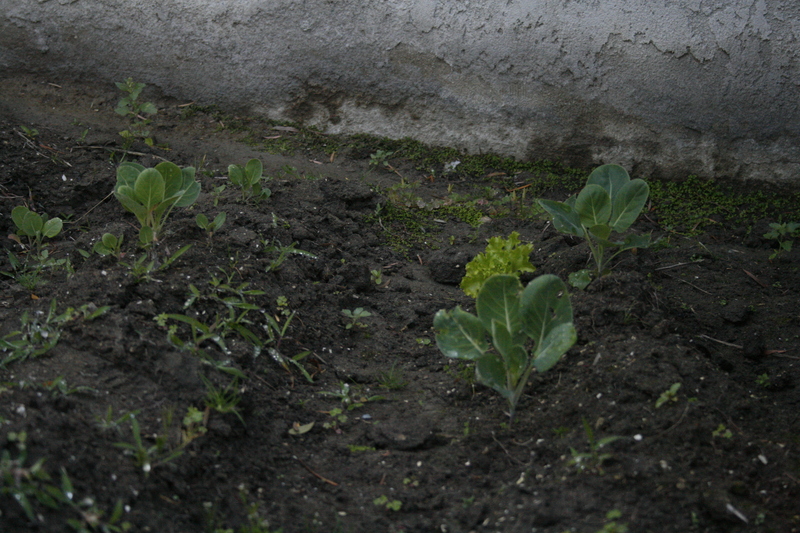 Brussel sprout plants and weeds (please ignore the latter). 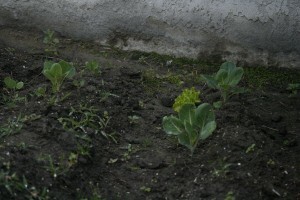 We really love brussel sprouts, so I really hope they produce. 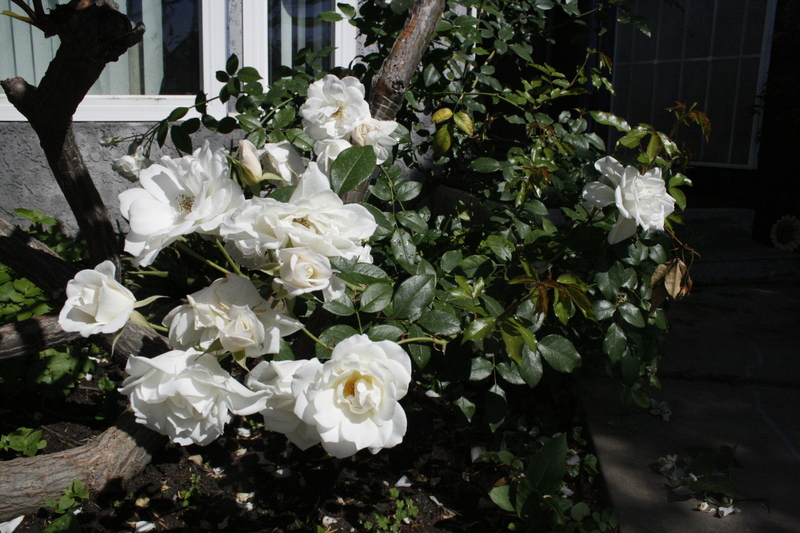 Also grown from seed. So far tiny and nothing. But it’s only June. There’s still time. Our little rented piece of land on the busiest street in town is giving us some wonderful food to enjoy. We are thankful to see all God is providing for us! beautiful lana! such energy you have / freeze your last berries so you can have a smoothie mid summer! 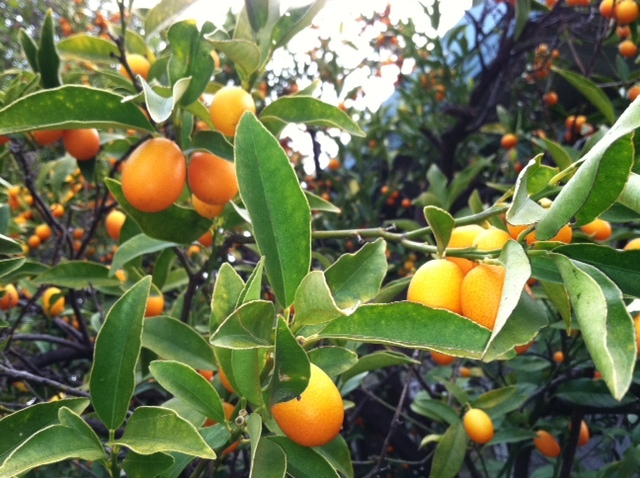 love that kumquat tree and your adventuresome spirit!